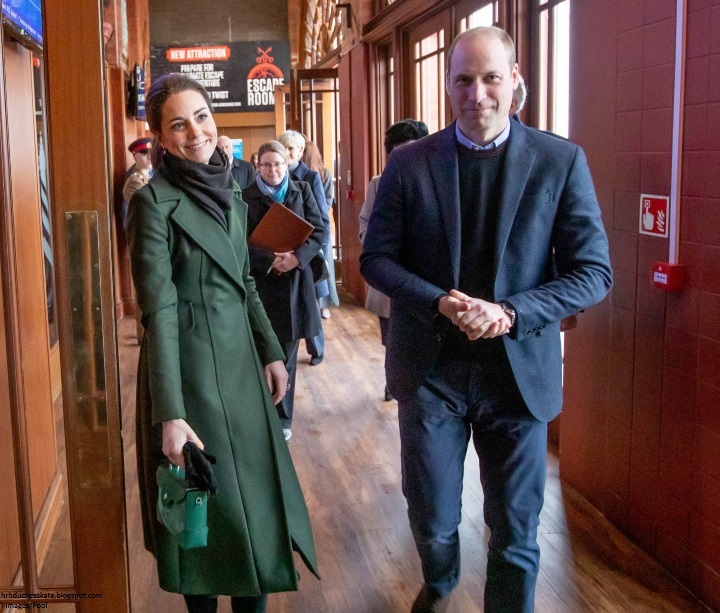 It was an 'away day' in Blackpool for the Duke and Duchess of Cambridge. 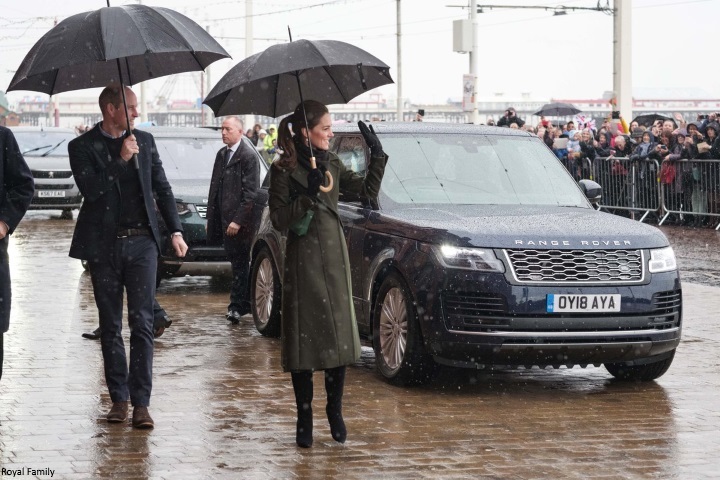 Despite the rainy weather when they arrived, William and Kate were warmly greeted by locals. 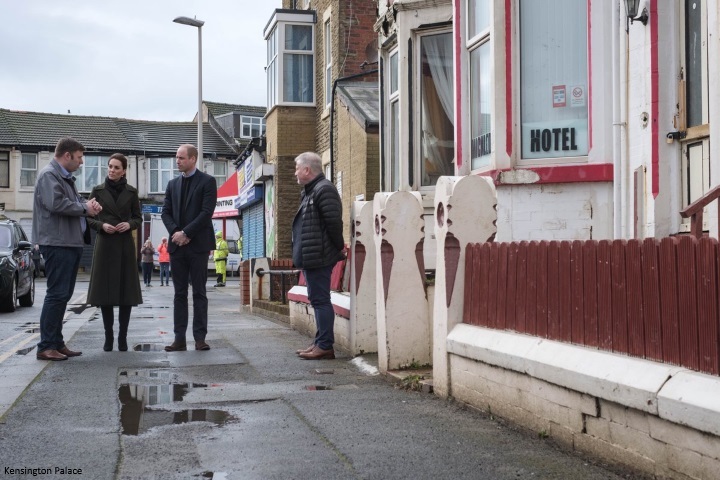 The couple travelled to the seaside town to see a series of innovative projects that are focused on investment and regeneration, as well as learning how the resort is leading the way in tackling some of the social and mental health problems faced by people in Britain today. No visit to Blackpool would be complete without a stop at the iconic Blackpool Tower, one of the UK's most famous landmarks. Blackpool Tower was opened to the public in 1894. Inspired by the Eiffel Tower in Paris, it is 518 feet tall and is the 120th-tallest freestanding tower in the world. Inside, they joined a roundtable briefing about the town’s recent history, the challenges, and the investment and regeneration efforts that are currently underway. 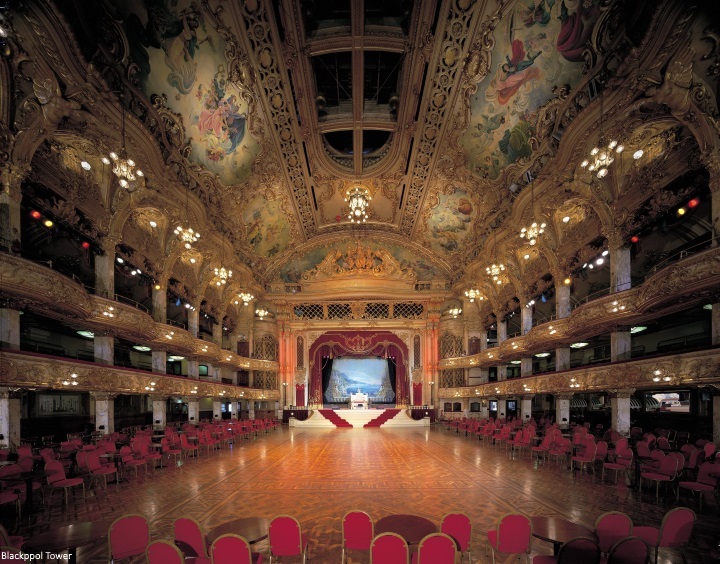 Next, they spent time in the world famous Tower Ballroom. They watched dancers waltz to I Shall See You Later, played on the Wurlitzer by Chris Hopkins. Dating back to 1894 it is known for its unique sprung dance floor and spectacular architecture and remains to this day a destination for dance fans from across the globe. 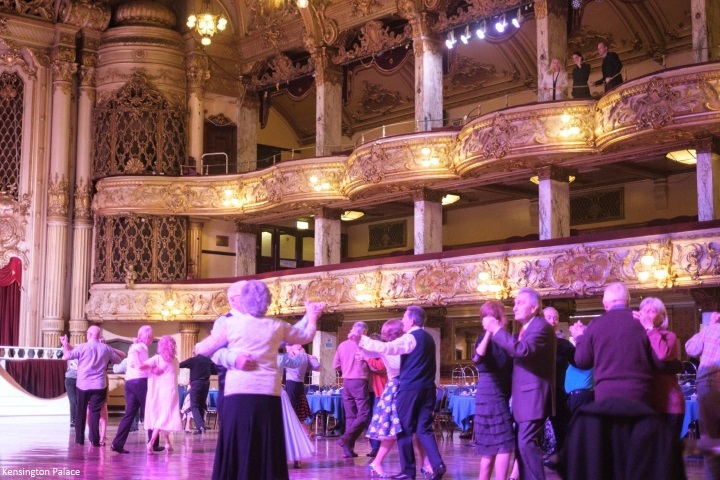 Fans of Strictly Come Dancing will recognise the ballroom from 'Blackpool Week'. Outside, they were greeted by locals on Comedy Carpet in the promenade. 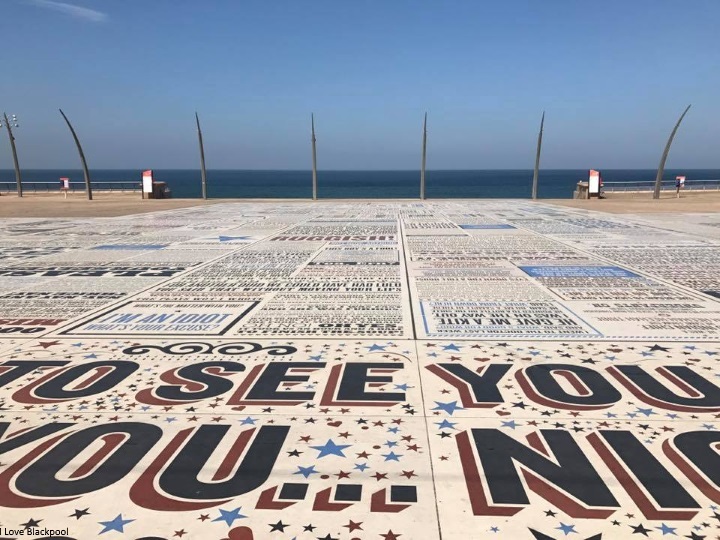 Blackpool's Comedy Carpet has been compared to the Hollywood Walk of Fame; instead it immortalises and celebrates the jokes and songs of Britain’s most well loved comedians and writers. The well known Bruce Forsythe phrase 'Nice to see you, to see you nice' takes centre stage. 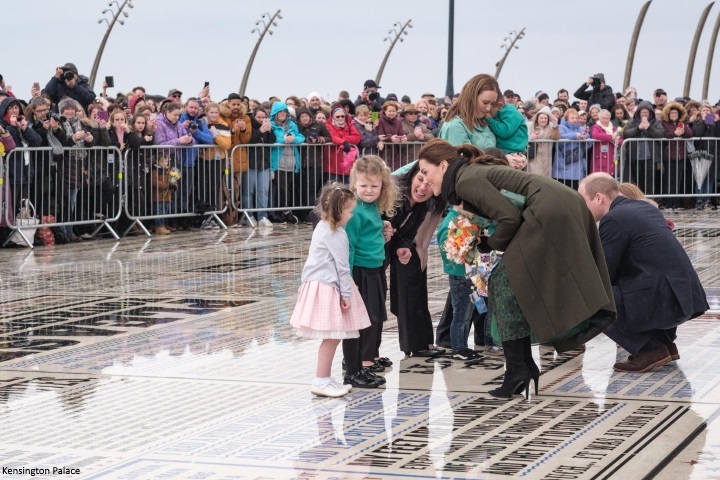 'On a walkabout outside the Tower as they visited the Comedy Carpet on the promenade, Kate told well-wishers she hoped to bring her children Prince George, Princess Charlotte and Prince Louis to visit Blackpool next time. She joked: 'Is the weather always like this?' The duchess expressed her disappointment at not going up the Tower. 'No we didn't. Next time I think. There's so much here the children would love as well. Hopefully next time we'll bring them back.' 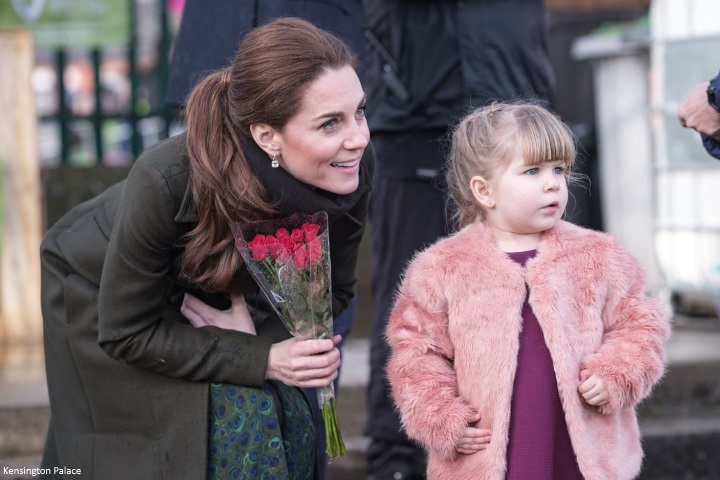 As one little girl shouted 'Hello princess', Kate waved and smiled. Prince William greets the crowds. 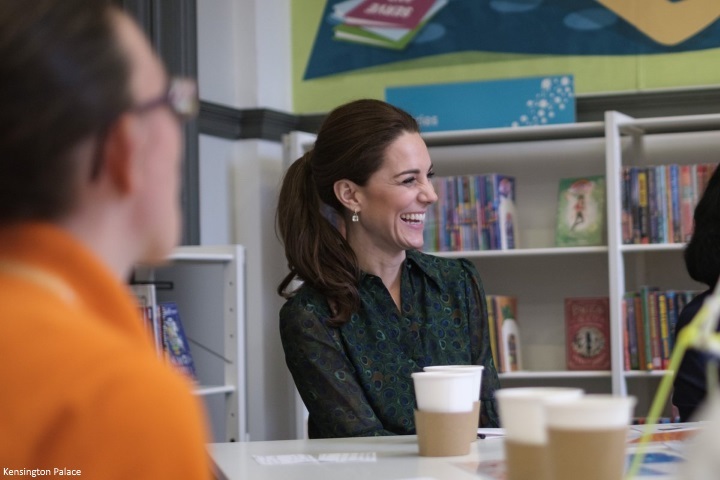 Kate chatted with locals about the weather, she said "It's been really exciting to visit". 'Among the spectators on the promenade was Andrea Bellamy, 31, from Wigan, who had arrived at 9am to get a good spot. She was rewarded with a two-minute conversation with the Duchess, who offered her condolences to Mrs Bellamy. Mrs Bellamy raised £1,250 in a skydive last summer for Place2be, a children’s mental health charity, who Kate is the patron for. She said: “It was a dream come to true to meet her. “I told her about how I lost a close family member to suicide last year and how important it is to get early intervention. “She said she was sorry and I thanked her for everything that the charity is doing for mental health. Kate was given beautiful flowers. The little girls didn't forget William, they presented him with a paper crown. 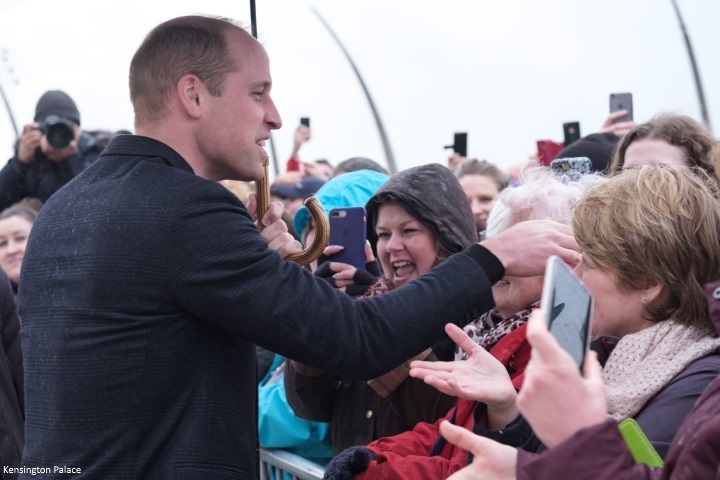 'The royal mom and Prince William greeted fans for half an hour during their visit to the seaside town on Wednesday, causing their engagement to run over by about 15 minutes despite the showers. 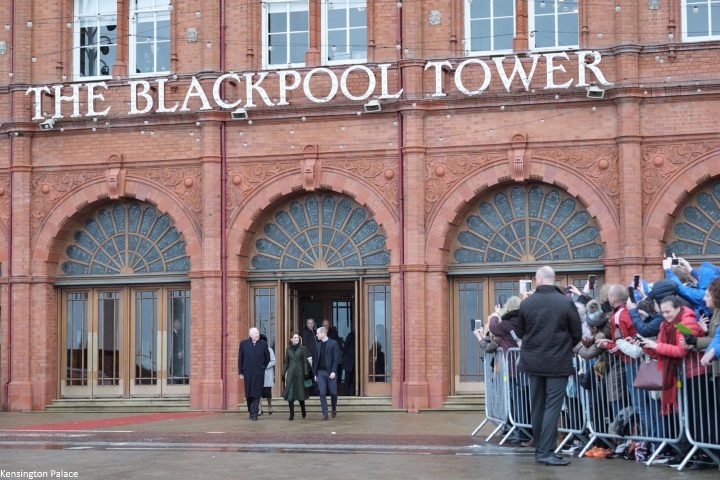 Although the couple popped open umbrellas when they arrived to Blackpool Tower – where they joined a roundtable briefing about the town’s recent history and the investment underway to rejuvenate it – Kate declined using an umbrella during the crowd meet-and-greet to ensure that even those toward the back of the group would be able to see her. From there, it was an embargoed engagement for the royal couple. They visited a poorly maintained former boarding house on Kirby Road which is in a terrible state of disrepair. 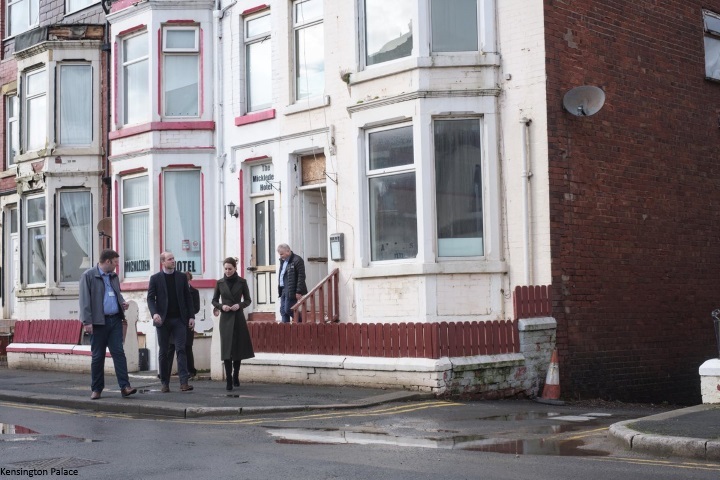 Housing is a critical issue in Blackpool, the couple saw the realities of the town’s housing problems and the significant work under way to resolve these. 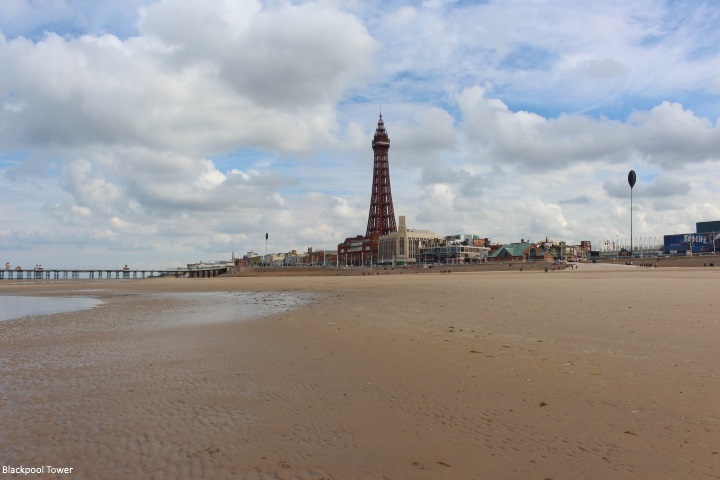 In February, it was announced Blackpool Council planned to borrow £41 million to drive its housing programme forward. The Gazette reported: "Blackpool Housing Company has bought more than 100 properties and some of the projects already undertaken and converted them into around 300 homes, including conversions of problematic properties in Albert Road, have been praised for the quality of the improvement works and the positive regenerative impact on the local community. The housing company was launched with an initial funding pot of £27m, secured through the Lancashire Growth Deal, with the aim of dramatically improving private sector housing standards across the resort and delivering the kind of affordable homes in which individuals and families would want to put down roots." Across the road, William and Kate visited Christina Jackson in a similar house which has been purchased and upgraded. Over the past year, around 50 bedsits in the area have now become 13 good quality homes for families. Whilst it's wonderful to see the royals highlighting well known areas in towns and cities, it's also very important to shine a spotlight on issues residents are facing, which is why I thought this engagement a particularly important one. Reporter Rebecca English was told the visit "was quite an eye-opener " for the couple. 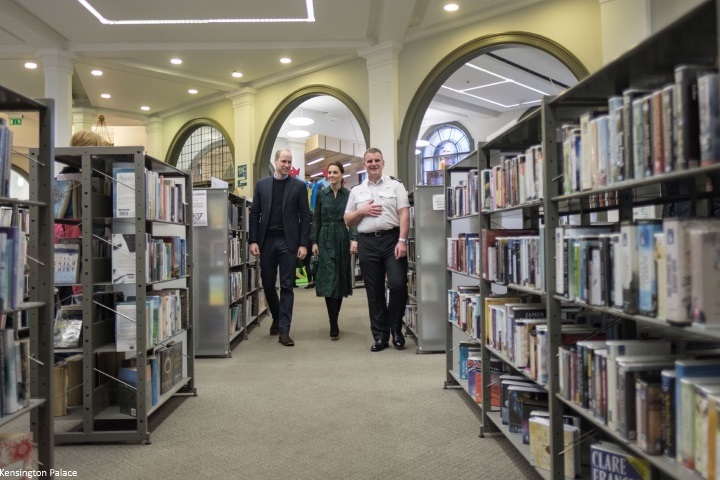 William and Kate travelled to Blackpool Central Library where they joined two separate discussions focussing on issues and initiatives of particular relevance to each of their ongoing charitable interests. 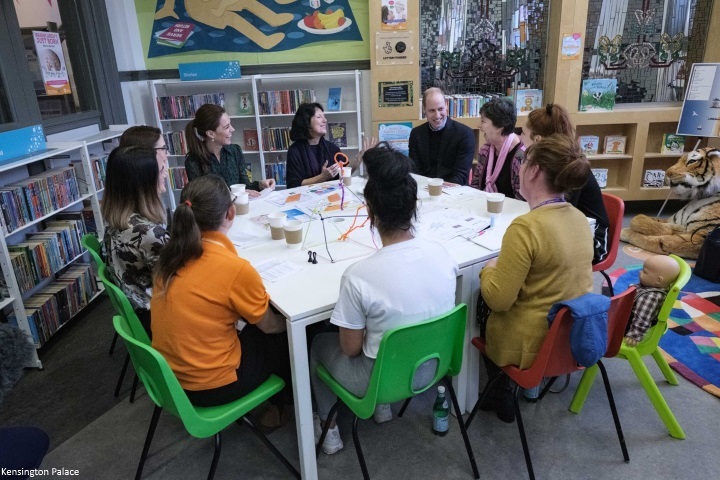 The Duchess met a group of people involved in Blackpool’s ‘A Better Start’ programme, including health visitors, practitioners from the Family Nurse Partnership, and parents. The session discussed the impact of long-term investment in mothers, fathers and children in their early years. 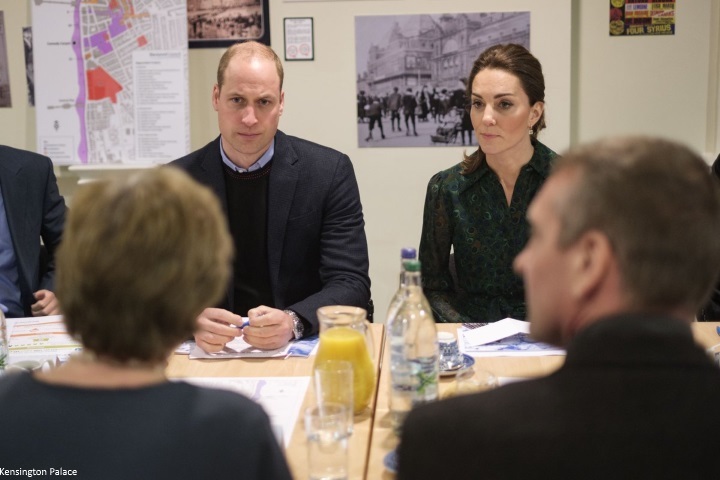 William met people affected by problems around mental health, including issues such as homelessness and addiction, and met people making a difference through the innovative work locally. Then the couple were introduced to representatives of the emergency services and first responder community. 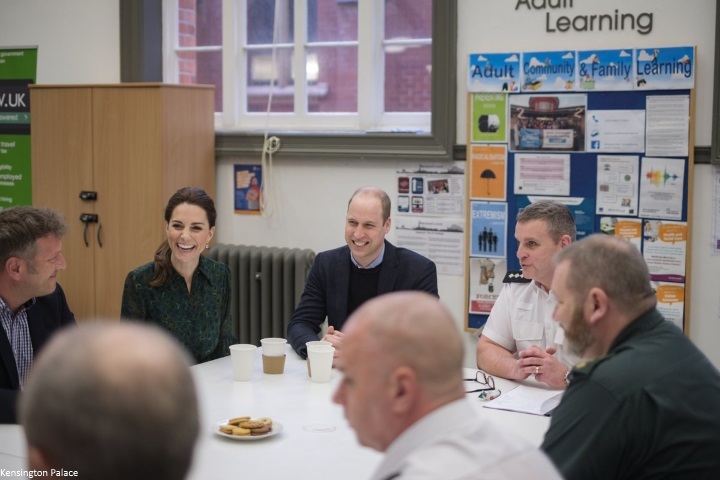 'Best friends Louise West, 34, and Steven Brown, 40, who described themselves jokingly as 'the other Wills and Kate', met the royal couple during a visit to Blackpool Central Library, where they heard about a number of mental health projects in the town. One scheme was Jobs, Friends and Houses, which helps ex-offenders to transform and better their lives with around-the-clock support to help them find employment and provide accommodation. Ms West told William and Kate how she became addicted to drugs from the age of 13 but had not used for two years. She said she left Oldham where she was a victim of domestic violence to go to Blackpool near her mother. She said she was working on her recovery every day but she had started to enjoy life and had even sat her GCSEs at the same time as her daughter. With her 17-year-old daughter at sixth form college, Ms West said she would like to study psychology in the future. 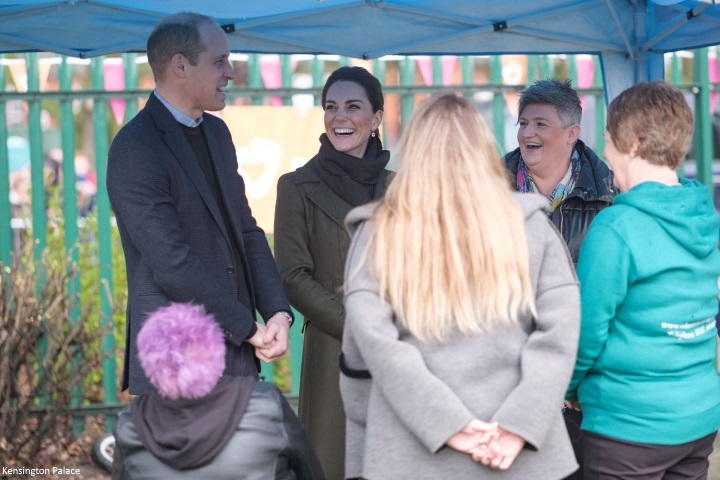 Finally, the Duke and Duchess visited Revoe Park, a recently revamped community garden and park that has been transformed thanks to involvement from ‘A Better Start’. The park had previously been a known location for drug use, in an area of significant deprivation, yet is now a great example of how a long-term community led initiative can transform lives and provide new opportunities. 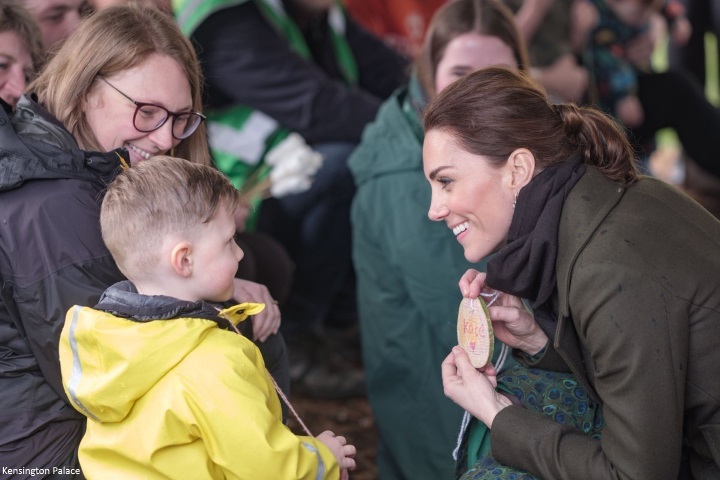 Jack gave Kate a woodland necklace with her name on it. Kate wore her much loved green Sportsmax coat. The Duchess first wore the coat on Christmas Day 2015 and again in February 2016 for a day of engagements in Edinburgh. Kate also wore it for Sunday Service at Sandringham in 2017. 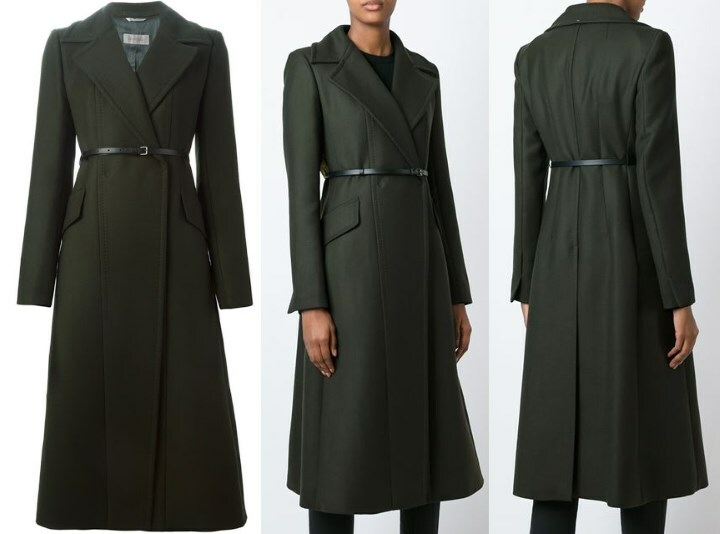 The Long Belted Coat is made of green virgin wool and comes from the Sportsmax Autumn/Winter 2015 Collection. It features a V neckline and two deep side pockets. It originally retailed for $1,800. 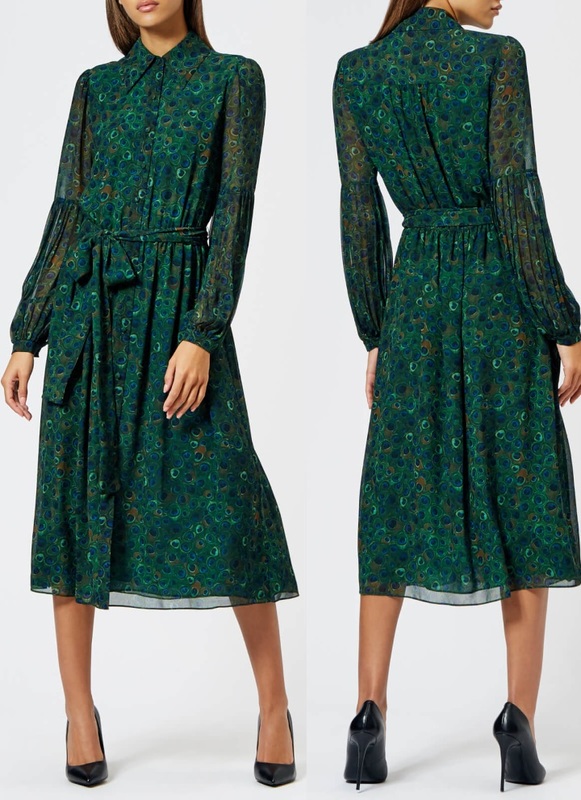 The Duchess teamed the coat with the very stylish £158 peacock print MICHAEL Michael Kors Women's Midi Dress in joule green. 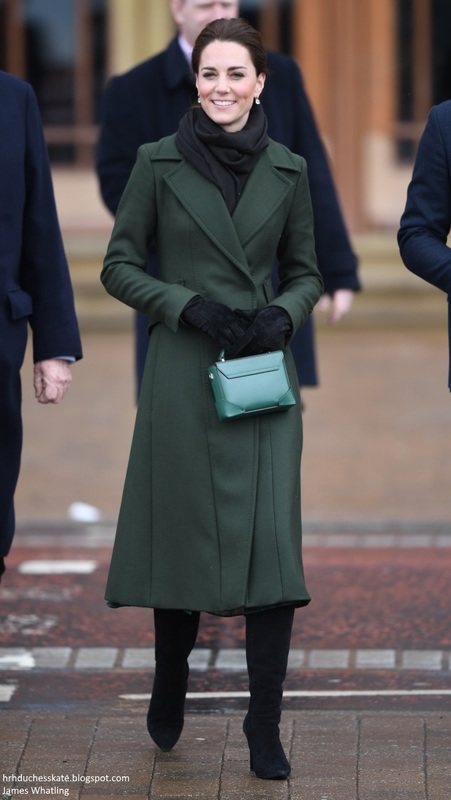 The Duchess carried her Manu Atelier Green Micro Bold Leather Shoulder Bag (with thanks to UFO No More). The green leather/suede combination is currently sold out, however the bag is available in green leather here. 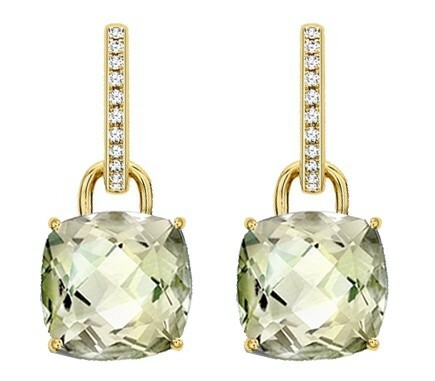 The Duchess accessorised with her Kiki McDonough cushion cut green amethyst and diamond earrings. Middleton Maven suggests Kate's boots are an older Ralph Lauren style. Kate completed the look with a black scarf. 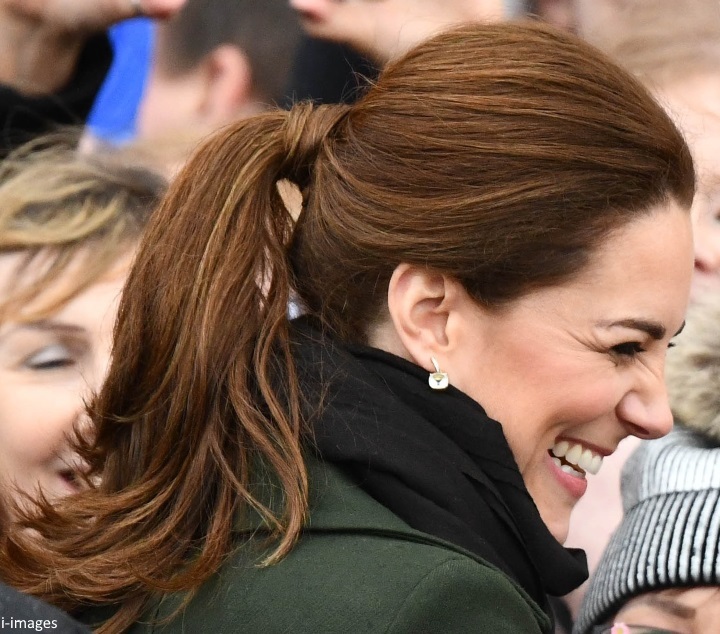 A closer look at Kate's stylish ponytail. I very much enjoyed seeing so many quotes from the day. 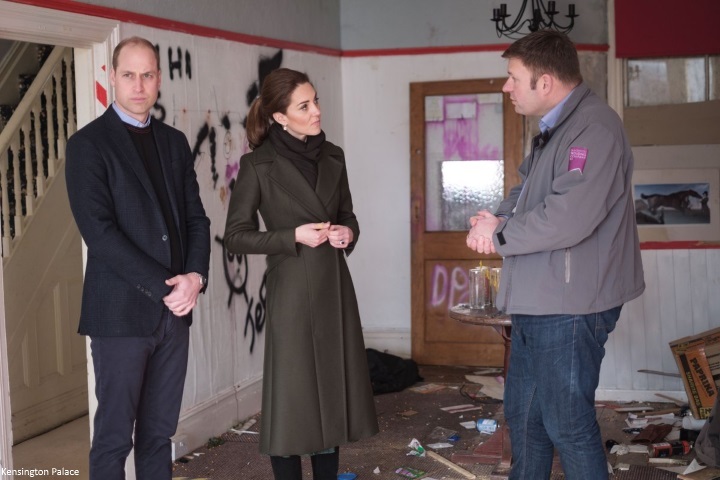 I thought the itinerary was well planned, focusing on tourism, issues close to William and Kate's heart and shining a light on housing issues in Blackpool. Away Days tend to offer a lot more variety and interactions, today encompassed all those elements. 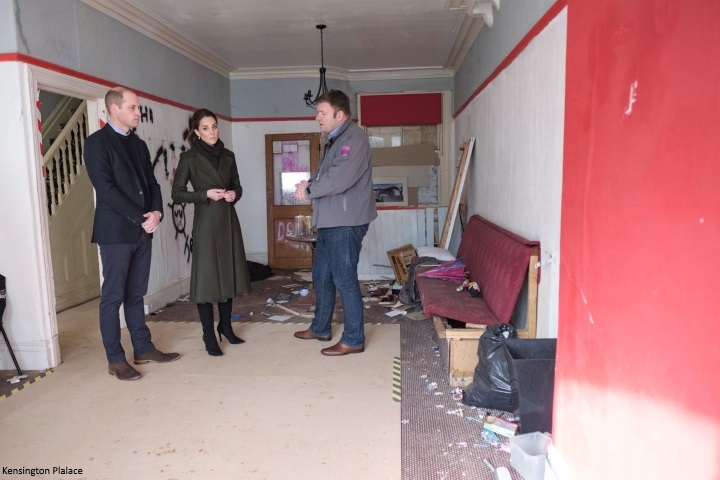 Following on from their recent visit to Dundee, where they spoke to local factory workers who will be made redundant next year, a Palace aide told reporters we could expect to see more engagements highlighting difficulties around the UK. I'm really looking forward to seeing this develop in the coming months. We'll see William and Kate on Monday for the annual Commonwealth Day service at Westminster Abbey. It will be televised live on the BBC at 2.15 pm. As always, I look forward to a nice away day! I like this coat and is great to see it again! It must be one of her more repeated coats by now, I would think! 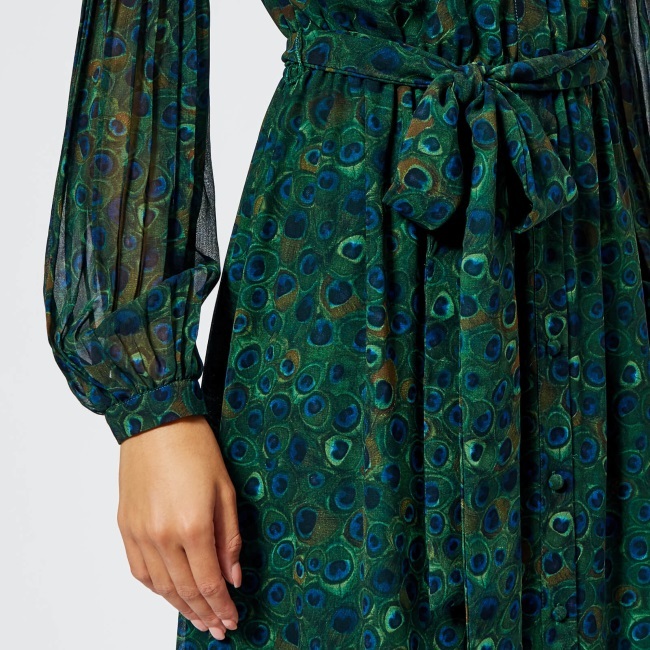 And from what I can see of the dress, does it look like it might be peacock patterned? Hope we get to see it better later! I always like a good old ponytail, she alwasy looks so pretty in that! Looking forward to the rest of the day! She really looks good in many hues of green. Might be because of her eyes! It's a nice and fun print without being too loud! +1, Kiwi Gal! Kate looks fabulous. Agreed! At first I didn't recognize the coat. I really think that's a lovely coat. And agree, I like the print of the dress, glad she wore it open neck. I would like to see the sleeves a little bit better as I like the pleating. Great overall styling in IMHO. The coat actually looks quite different without a belt! It does look very different without a belt. I liked the coat when she wore it a belt but I like it much better at least on Kate without the belt. I agree, love the coat so much more with out the belt!! you notice the details so much more with out it and this is a great coat! Loooooovely new dress! Great hair, bag & boots. I've always loved this coat but I preferred it with a brooch and the snakeskin belt, they just enlivened the colour a bit. Love this outfit! If yesterday was a total miss this is a total hit. Love the green coat, the ponytail (IMO it frames her face better than the wavy blowout), the boots, the dark green dress. I think Kate is one of those people who is so pale that she needs darker colors. Dark greens, blues, etc. The pale pastels wash her out, whereas the firmer colors give her pop and an extra glow. I also love that she carries her own umbrella. I think some very dusty pinks and blues work on her in the way that she looks like a serene porcelein doll but I agree that she looks her best in stronger and darker colours. And yellow! Rebecca agree. There are some pale colors that work beautifully on her but it is very specific tones and shades. I thought the example yesterday of the the pale blue shades of dress, the one she wore yesterday and the Beulah London Sabitri dress was a good example of this. But the stronger vibrant or darker shades do work well on her. She followed yesterday’s esquisite look with an equally beautiful presentation today - our Duchess, she is radiant, confidant, charming, and oh so lovely! Kate looks gorgeous!I wish she wore ponytails more often,It takes 5 years of her face.I really like the dress too although I am not crazy about that shade of green. Natalia - I'm with you. I like Kate in a ponytail and I feel it can be such a polished look. Classically cool, calm and confident. I love this dress and coat. Green is Kate's best color. I'm a sucker for a peacock print and colors. She looks lovely and engaged. She does love that style of dress with the fitted sleeve. I'm not sure I'm such a big fan of that style. I think this is one of the best looks she's ever done. She looks in her wheelhouse, and yet fresh with the (peacock!) dress underneath. The 3rd photo down, the heads on full length shot, is so beautiful that I gasped. The earrings, the pony, the coordinating but not matchy scarf - it's really elegant but not fussy. She looks gorgeous. Really like the whole look today. So happy to see she wore the dress with the colar open. Really nice combination of coat, boots, dress and works well for the days engagements. I agree with the collar open!!! I think it makes the blousy sleeves and midi length less confining. Ugh if only I could afford her wardrobe!!!! Love love love the print! 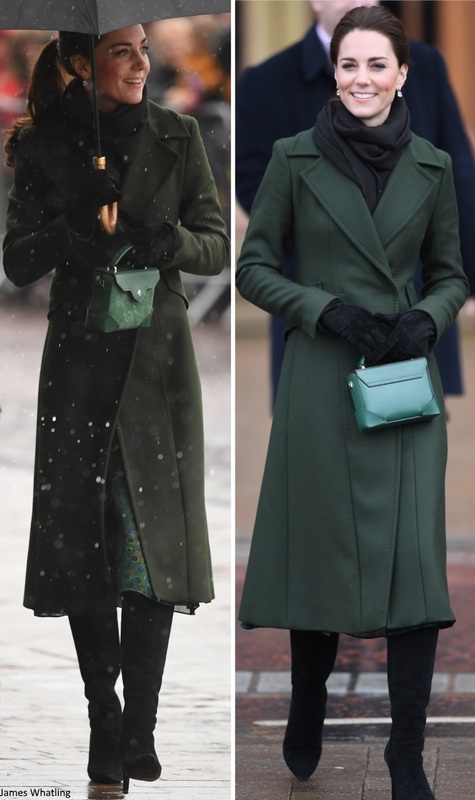 Love the coat, love the dress, love the bag, love the boots, love the earrings, love the ponytail, LOVE THE DUCHESS. Need I say more? Yes Tammy, love the Duchess!!! Love the wrapped ponytail as well. Have not seen Kate wear it that way in a while. Very cute. Kate looks absolutely wonderful! Love the coat & dress everything except the purse. Don't mean to be picky & maybe it's the light in the picture but the green color of the purse looks terrible with the green coat. Brilliant work highlighting these causes. Must be so rewarding to do what they do to help desperate causes. I love this dress on her! I think I like her better in green than in blue, I'm thinking of that cool minty/silver Missoni dress last week, plus this peacock dress today, and then of course that forest green dress last year at the BAFTAs with those amazing emeralds. Green is definitely one of her colors! Lovely choice of engagements and a great look for Kate. For me, this last 18months she has seemed to have a new confidencd and happiness about her. Can’t put my finger on it but it feels like there is a distinct extra glow which is lovely to see. I want Catherine Quinn's hat! She looked wonderful as did Kate of course. Seeing those rundown bedsits reminded me of the places I lived in outside of London in the 1970s as a struggling single parent. The state of the living space in that rundown rooming house was pretty awful. I'm so glad that they are highlighting this sort of problem and working toward solutions. I'm sure this is something that needs doing all around the country. She looks great in green. I feel like she has looked really happy lately. I always love when she wears this green coat; it looks lovely with her coloring. Great engagement, and wonderful look! Nice day of engagements. Nice outfit on Kate. Don’t care for the purse, but whatever. Beautiful outfit. Love the suede boots with the long coat. This dress is also gorgeous. I wasn’t a fan of the dress she wore yesterday, mainly because of the colour. This dress is a similar silhouette, but so much fresher looking because of the pattern. Love it. Drooling over that handbag as well. So lovely today. My favourite green coat and such a pretty dress to match. I agree with others they this simple ponytail is perfect, especially on a windy, rainy day. Great look for Kate. Absolutely love the ponytail, and she looked so chic during the meet and greet. Lovely post. Charlotte, I think this is one of the best posts you have written for DKB. I really got a sense of this bread and butter away day. The photographs ...a thousand words each. Kate's fist bump with the little girl. 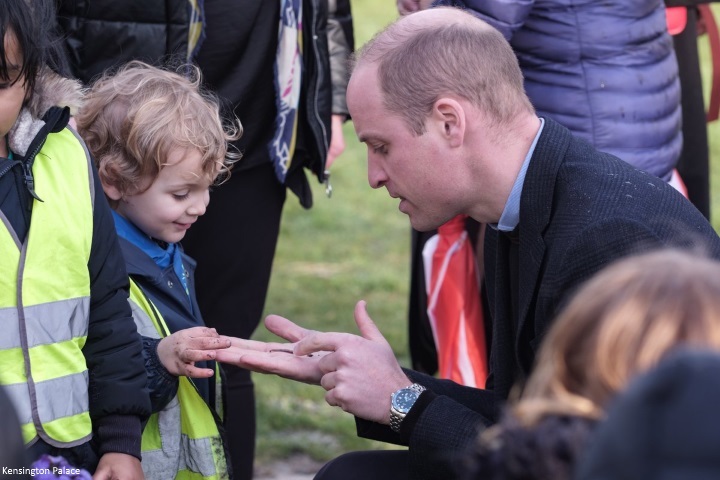 The child with his fingers gently resting on William's hand. I think we are in for many, many more days like this. Today I saw a future King and Queen in action. Years from now I believe they will continue to exhibit this youthful, yet dignified spirit. Someone once said here that they will lose their appeal as they lose their youth; I don't think that will happen. I think they will be a couple that remains young at heart. I also hope that the almost palpable bond that unites them now will continue. 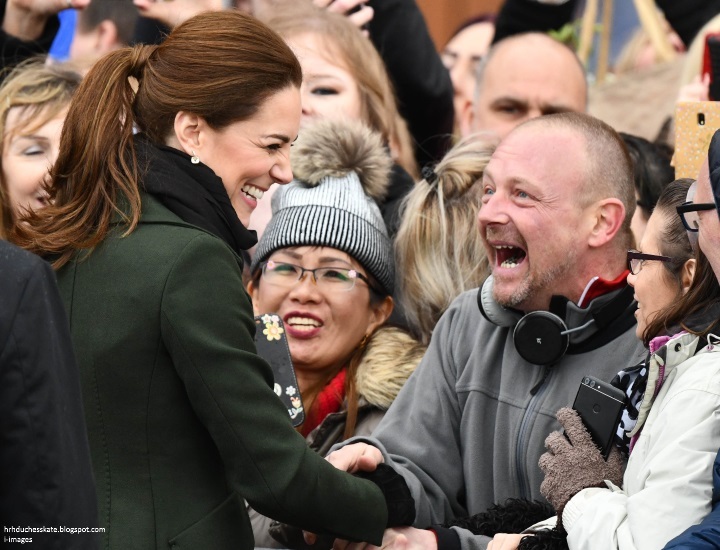 Another moment-after the woman who had overcome addiction said that meeting the royals wasn't the highlight of her life; rather, it was her daughter's inviting her to meet the daughter's friend's parents--Kate's focus was clear when she asked," What is your main message to people?" The outfit: Unlike yesterday's reception for Charles, today was Kate's day to shine--and shine she did, despite the rain. Even William looked spiffy. Her recent fling with green inspires me to wonder what she has left to show us for St. Paddy's Day-less than two weeks away. I would have to agree - Charlotte this was fantastic. Love the photos and the detail. I also agree that today we saw a future King and Queen. They are naturally energetic and warm. You can feel the fondness for one another. Kate has truly come into her own. On the fashion front I adored this look. So polished, great color on her. She has really been glowing lately. Love to know her skin care regime. Wow!! Love the green dress on Kate, and she is wearing the collar open! I don't think I've ever seen her in her beloved shirt dresses any less than all buttoned up. The open collar and pony tail are very becoming! Must be chilly and damp today. this is one of my favourite coats from her (not small) collection. It is a good colour for Catherine and it fits well. Like all Sportsmax outfits, it gives a good balance between classic and youthful and the tailoring is exquisite. The dress works well for today's engagements but, whilst I agree that it doesn't wash her out as yesterday's choice, I think it would have been too casual for Charles' investiture anniversary. I tend to agree with the suggestion made that these are a pair of Ralph Loren boots from previous collections - I bought a very similar pair from Ralph Lauren in 2014 (they may be new to Kate, although I am not sure, they seem gently worn). Overall, if Catherine has a "style", today's choices fit in what one could call a "classical Catherine" (in my opinion). Moving on from the fashion side... Great to see them both in their element - and that they have such a broad set of interests. Hoping they will keep up the pace of engagements - they do make an impact when they visit and get engaged. These causes need all the support they can get. What a great day out. I love the videos of them both interacting with the crowd. Kate's confidence seems to have grown over the past year. I love everything about this outfit -- color, style, accessories, and her hair. I saw video on Twitter of W&K walking to the helicopter this morning holding hands. Very cute! That ballroom is incredible. I think I need to fly across the pond again just to see it!! Love this look from top to bottom! She just looks fantastic. A nice day of engagements. where to start with this fabulous post?!! Onto the visit, I have to say charlotte that I agree with someone above, this piece was written so well I was sucked right into your narrative, kudos to you, best blog anywhere on the DoC! What an eye opener for them to visit these places. I am so glad they are taking the time to make visits like these and draw attention to these causes, they need all the help they can get. I too hope that they keep up the pace and keep the momentum going on these endeavors, they really can get a long way in many areas, as this is a long game It will be interesting to see all the results down the road. very proud of them. Great outfit and great day of engagements! The dress is beautiful! I agree she really looks great in jewel tones which really is hard for me to say because I love a pastel dress personally. Very well-planned like many of their recent trips. I appreciate them not shying away from showing the difficulties of the town but that they also highlighted the many positive aspects and showed Blackpool and its people are not just giving in. Loved Kate in a ponytail today and the whole outfit. Good colour, rewears and the new dress is a reasonable price. Attractive and appropriate but ensures the focus was on the different projects and people of Blackpool as it should be. My favourite moment of the engagement is during the time that children are presenting paper crowns to the couple. A tiny girl gives something to William and is so excited that she jumps up and down. Great “Away Day”. The Duchess looked very nice and always seems so kind and generous to the people. Thanks again Charlotte for enlightening my understanding; this time of issues re Blackpool. Such a nice and important joint engagement! I love to see them together. They are so warm in their interaction with people! As for Kate's look, I share the opinion of many of my fellow commenters: green suits her! I love her coat, her dress and all the accessories. Lovely ponytail as well. Great job, Charlotte! There have been many observations about the Duchess of Cambridge’s “new” confidence and ease and rightly so. With all of the emphasis on mental health and with her brother writing about his struggles but also about his success with therapy, it occurred to me that the Duchess may be doing some therapy. Even the most well adjusted person would need therapy to cope with the scrutiny and pressures of her position. I could imagine her and William thinking “What right do I have to be King or Queen some day?” and subsequently feeling not comfortable in their roles. Someone, whether it is Catherine Quinn, Pronce Charles, a therapist, or the Queen herself, might be helping Catherine in particular to mentally adjust to her situation. She seems more able to accept the adulation and resposibilities, instead of shrinking back. There were times over the years when she looked so tentative. It must have been very difficult at times. This is of course all speculation on my part!!! Whatever the reason, her confidence is a joy to observe. Gives hope about the state of our role models, good (but not perfect) people trying to do good things, as so many prominent people in our culture have come crashing down lately. I also hope her confidence and the confidence of the Duchess of Sussex will win out over the inflammatory criticism of some parts of the press and commenters on social media. Do even more Duchess Catherine! I recently started therapy after resisting it for years, afterall I am a fairly well adjusted functioning adult. But going to therapy was the best decision ever. Within two sessions I was telling my therapist that I could not believe how many things and feelings I convinced myself was normal, when clearly it is not. If that is the case with Kate I can just say therapy is the beat gift you can give yourself. Thank you for your wonderful post as always! Do we know, or are trying to find out what scarf and gloves she is wearing? I think this is one of the most versatile coats she owns. The diagonal panels give the coat a unique touch and the colour is ever so flattering. I loved the overall look and thought it worked perfectly with the engagement. Great to see her in a sleek ponytail again. She has grown her again a little bit and I think it looks great, it makes ponytails look more flattering. Does anyone know the maker of her gloves? Silly question but they caught my eye and I thought they were lovely. A useful way to get an idea of how Kate has evolved over the years is to compare the side by side photos of her Charlotte provides for outfits worn several times over the years. Except at times during the first year, before their resoundingly successful first Canada tour, I see a uniformly smiling, warm, outgoing woman who reaches out to others. A confident woman. I have said a number of times in the past that Kate's personality and talents lend toward one to one or small group communication. I don't think this indicated a lack of confidence in all areas. She recently admitted to being shy as a school girl but gave no indication that her shyness -which, rightly or wrongly is seen as a lack of confidence-extended into her adult years. This from Kate herself. Certainly not into years as recently as just prior to Louis's birth. Humility or putting others before self is also misinterpreted as lack of confidence. I do not see any great change in Catherine herself. I see a change in attitude of others toward her, however, as expressed here and other forums. I have my private ideas as to the basis for this change--seeing Kate's talents more than failings. Perhaps Catherine isn't the one who has altered. I realise we all have opinions; however, when we start basing conclusions on opinion and speculation we ascend a slippery slope. For example: William and family took a ski vacation( three years ago); there is a school break now and they are on holiday; therefore they must be skiing, or on Mustique. Or, They spent Christmas two of the last 7-8 years at the Middleton home; they must plan to alternate between the families; therefore, the Cambridges will spend this Christmas with the M's, as they were with the royals last year. And once it was clear that they were celebrating with the Queen, and based on the speculation that there was a rift between the C's and the S's, it was concluded that their plans were changed for PR purposes due to the rift. Someone, somewhere started the more confident since Louis theme. Repetition via the internet imprinted this idea.At that point people noted that, yes, she does look relaxed and happy. It was concluded that this must be since Louis's birth and speculation ensued for the reasons for what was now broadly seen as a change in confidence since Louis. For example:she is finished with child bearing and no longer needs to fear HG. She has a new family member to mentor. Or she needed and received counseling, mentoring. All these explanations for a conclusion based on opinion and speculation to begin with. We see this sort of reasoning in the tabloids. Apparently Twitter is ideal for encouraging this instant action-opinion-conclusion based on opinion, not the original action. A recent popular story in the news concerning a possible hate crime that received immediate response and reactions on social media show how wrong this sort of instant conclusion forming can be. Have those who have decided that Kate is newly confident actually gone back and taken a second look? If she was hesitant in speaking to a group was it concluded that she lacked confidence in all circumstances? Compare her demeanor at a charity engagement after Louis's birth to her demeanor at a similar event several years ago. Or her appearances during royal occasions--balcony appearances or church events in the years pre Louis and the one less than two months after. I think it might be clear that Kate's handling of speech making ( which was attributed to lack of confidence) has improved with time and practice and that may be the basis for saying there is change in her over-all confidence. Very well said - thanks for pointing this out. Anon 18:11 really excellent points. Plus Catherine is just getting older:):) But I agree so much speculation and the repetition in social media these days, you have to watch it to not buy into stuff that is just repeated. I love this whole look. It hits the same note for me as the outfit Kate wore with the slacks, blazer, and sweater (I don't remember the date). I think Kate wore her hair was half up/half down but it was back from her face in a similar way and it just works. Both outfits suggest a person who knows her own power. I love that. For the 50th anniversary of Prince Charles' investiture I remarked that Kate's choice was appropriate and that she nailed the look for that reason. Today, I think Kate nailed it full stop - no qualifying necessary. On a final note, this comment posting activity is new to me but it is surprisingly fun. Thank you very much for giving us some of the best all around insights into the Royal Family's activities. I find myself wanting to check your site several times a week as a fashion blog, but also more and more as a source of the best news information. Thank you, again. I adore this whole outfit. I have a weakness for peacock prints. Didn't she change boots at some point during the day? I saw a picture on Twitter where it looked like she did. Yes, it appeared that she changed into a pair of her black flat boots, most likely suede which made the change somewhat seamless. Finally an engagement with Kate and the Queen, how exciting. Hope that Kate will also hand out shamrocks on St. Patricks Day!! gorgeous outfit and i love that purse of hers! thanks for your continued hard work Charlotte! Catherine looked lovely, she usually does, but I particularly like this coat and the pony tail was really good as Blackpool often has very high winds. Brought back happy memories of childhood holidays during WW2. It was our nearest seaside and travelling was difficult--I remember it took hours to get there by train, particularly when I was eight--just a couple of months after "D" Day and our train kept being shunted into the sidings to allow military trains to pass. Nevertheless the sun always seemed to shine. This outing with HM is interesting. Cannot help wondering if the Queen is about to transfer another patronage. Jean, thank you for sharing your wonderful memories. It was a treat for me to read them. Jean gives us a unique perspective that I greatly value. It looks like William and Kate had a meeting/received Lorraine Heggessey, the Chief Executive of the Royal Foundation of the D/DoC and theD/DoS on Friday, if you want to add this to Kate’s past events. I find it very helpful! Love this post! Charlotte, the descriptions, quotes,& photos are detailed, honest, abd enlightning, and show some key, positive impacts of their visit. It also shows the warmth and strength of these local people. Makes me want to visit! Prince William & Duchess Catherine looked gorgeous, from top to bottom. Very confident, approachable, warm, and happy to be there. Beautiful. They make quite a power team! Prince William stooped down, with his palm up & out, talking with the cutest, little boy with muddy hands. And, both of them are looking at an earth worm, in William's palm! Maybe the worm is a present for William, or the boy's pet. So cute and so normal. Good job, Prince Wiliam/Dad! When will we see Louis again? It's nice to see them out so much; I guess this will continue now that her family is complete.